The mission of the Meade Public Library is to provide access to informational, educational, cultural and recreational library materials and services in a variety of formats and technologies; to be responsive to the public library needs of the community; and to uphold the public’s freedom of access to information. The library had its beginnings in 1895 when William K. Palmer of Rochester, New York, a former resident of Meade, donated books for such a project. He drew up a charter for the Palmer Public Library which was officially recorded by the Secretary of State and named trustees for the institution. These books were first housed in the office of the Register of Deeds in the Meade County Courthouse under the care of Mrs. Belle Peed (later Mrs. S. D. Adams). As the years went by, interest waned and the charter expired. During the mid 1920’s, the Arena Club Women of Meade went through the procedures to re-establish the long-expired charter of the library. It was decided to continue under the name of the Palmer Public Library. In the spring of 1928, the Meade County Courthouse in Meade was completed. The Commissioners offered a room in the basement for the use of the public library. The club started at once to have cases built that could be locked as there would not be funds to employ a full-time librarian. When they opened later that summer, the club found themselves $150 in debt for furnishings (not counting books and supplies). A tea was held on opening day under the sponsorship of the Arena Club and the P.E.O. Club. All the other clubs and organizations of the town, as well as many citizens, gave generous donations. The library was kept operating with a part-time librarian, Mrs. Emily Pinnick. 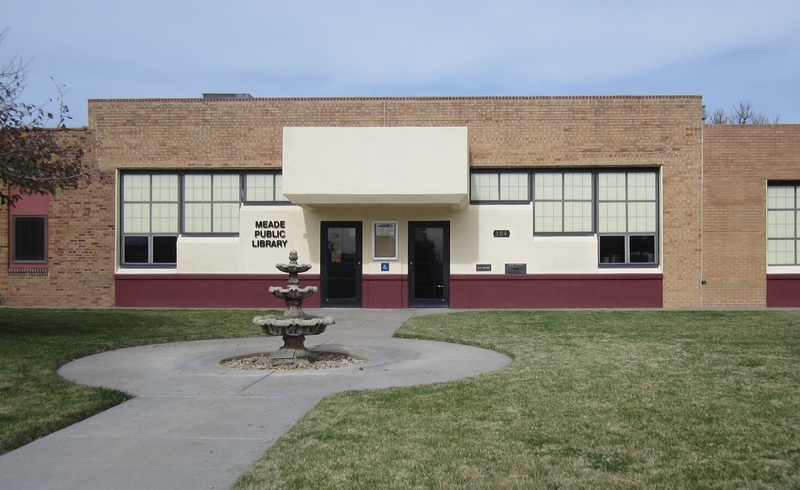 In 1934, a movement was started to bring the library under the charge of the City of Meade. The issue was brought before voters in 1935. The result was 109 to 29 in favor of the move. On January 1, 1936, the first money was received from city taxes, and the name was changed to the Meade Public Library. In January 1950, the City of Meade completed a new municipal building, and the library was moved to this location. Are jobs at the library City Paid, County or State? Sorry Lois, didn’t catch your comment earlier. The Library staff is paid by the Library. A library budget is submitted to the City each year as we are a line item on their budget that is turned in to the County. We are funded by taxes, fines and fees income, and donations. Hope this answers your question. If not, give me a call and I will try to answer more clearly.